This Paid To Read php script uses a database to store member and advertiser information. This ptc script is used as a stand alone website and is one heck of a paid to read script. Visitors can signup for free and earn points or money for reading emails, clicking on links, signing up to programs, paid for referrals (up to 10 levels deep), and more. Members can upgrade to gold and receive the following benefits… Random Referrals, Lower Payouts, and Shorter View Timers. You set the price of gold status in your admin area. This paid to read scripts offers the use of many different payment processors with simple turn on and off. These processors include… e-Gold, Moneybookers, Paypal, And Alertpay. You can also turn on and off which processors you want to payout with. Installation is fast and easy with the included detailed installation instructions. 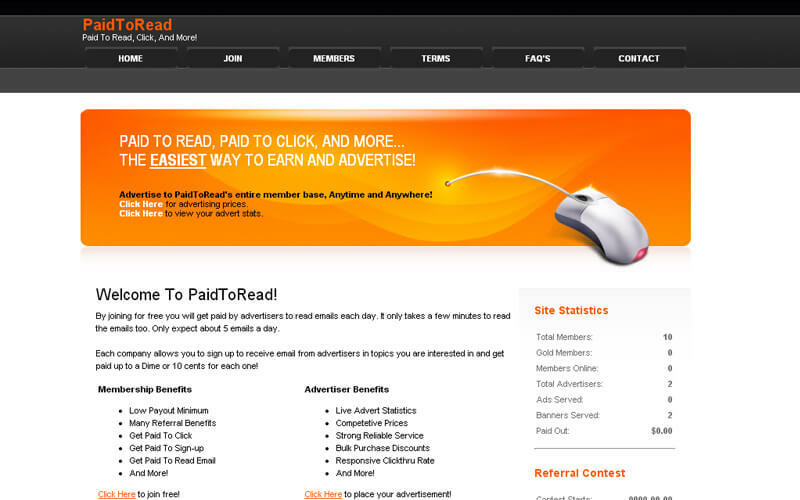 You can have this paid to read email php script setup and ready for members in about 10 minutes. SMS Gateway Available. you should be provide third party API details. If you need any changes in SMS module you have to contact for our technical team info@phpscriptsmall.com Cost will be Additional. Their customer service is the absolute best!! For a beginner, they were available to help me through the way. It was greatly appreciated! I’ll back guys! Great Work! Their professionalism stands out as well. I had to give this script in 5 stars, not for the documentation, or the configuration, but for the incredible customer support they offer. I have bought several scripts in some other places but this one by far as top notch customer service.